(aka Bicolor Runner, Painted Runner) Friar Antonio de Arrabida described this species in Flora of Rio de Janeiro in 1827. Incredibly beautiful bi-colored blossoms are very attractive to hummingbird moths. This strain is less affected by warmer temperatures than other runner beans and is a prolific bloomer. Esteemed as both an ornamental and edible climber. Pole habit, 68 days. ±450 seeds/lb. Instructions - Sow seeds outdoors after danger of frost has passed and soil and air temperatures have warmed. Runner beans prefer full sun, although they tolerate part shade very well. 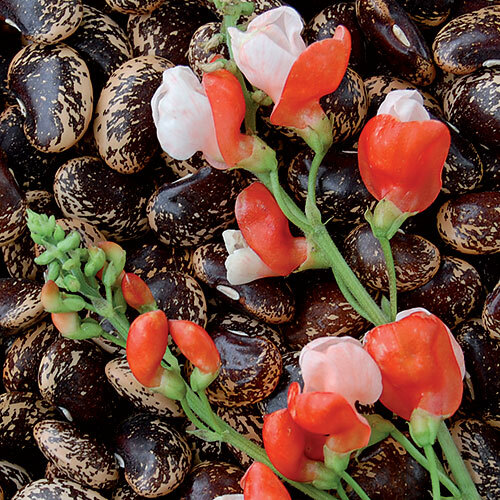 Young pods can be eaten whole, or the beans can be eaten fresh or dried. Even the fl wers are edible.